Always dreamed of going to space but never felt cut out for grueling astronaut training? Soon it’ll be possible to (almost) indulge this fantasy without leaving Earth. 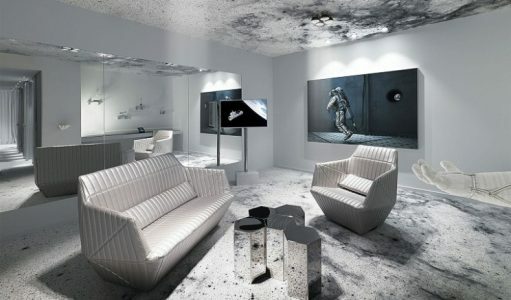 According to CNN, a hotel in Zurich, Switzerland, has just unveiled a new suite kitted out to look like the inside of a space station. Grand Kameha’s Space Suite comes equipped with a “zero gravity” bed — built to look like it’s floating above the ground — and steam bath designed to simulate a view into the universe. It features a two-screen video installation visualizing space debris in Earth’s orbit, spotlights inspired by rocket engines, and a shelf shaped like a space glove to hold phones or key cards. The room also has a library of books, audiobooks and films related to space travel, with an automated female voice inspired by John Carpenter’s science fiction film “Dark Star” welcoming the guests. To learn more about the space station experience, click here.